The heart of Jodrell Bank. 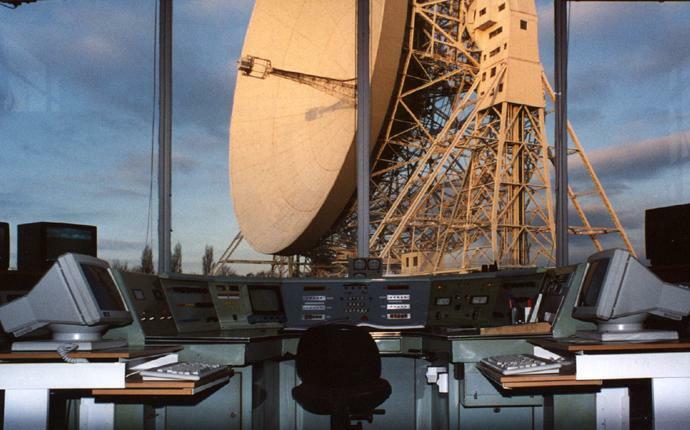 Here the duty controller take responsibility for the giant 76m Lovell Radio Telescope and monitors the operation of our other telescopes both at Jodrell Bank and our remote sites. It is also the home of the weather station and the clock which keeps Jodrell Atomic Time. This is the centerpiece of the control room - the Lovell Telescope Control Desk. From here the duty controller can manually drive the telescope for engineering purposes. Normally though he will use the computer terminal on the right hand side of the desk to drive it under compute control. 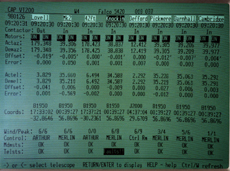 When the telescope is ready for use he will place it in "Remote Control" in which case control of the telescope is in the hands of the computer system carrying out the observations. 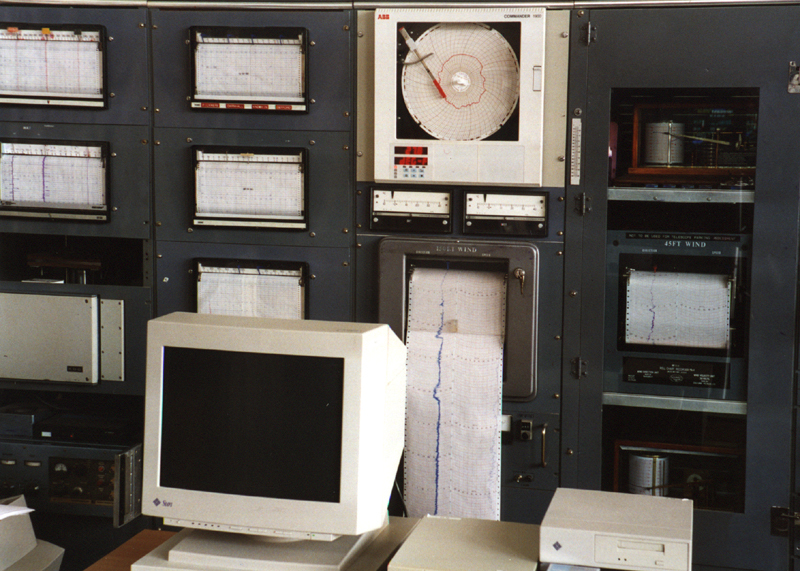 For Pulsar observations this computer is called "Arthur", and the terminal on the left hand side of the desk is linked into it so that the controller can schedule the observations. The weather conditions are of great importance to us. The most important are perhaps the wind speed and direction as, should the average wind speed exceed 35 miles per hour or has persistent gusts to 45 mph, the Lovell Telescope will be parked in the zenith with its two towers aligned along the wind direction. The wind speed is measured at both 40 and 150ft as the measured wind speed increases with height and much of the Telescope is above 150ft! The 150ft Anemometer showing two gusts of 90 mph! The pressure and humidity are required to make corrections of the radio path lengths through the atmosphere above our telescopes. The station clock keeps Jodrell Atomic Time (JAT) which is our own internal time standard. It is normally derived from a Sigma Tau Hydrogen Maser atomic frequency standard which provides an exceedingly precise frequency of 5 MHz. This is divided down in the clock to give precise one second "ticks" which are used to control all the timing functions of our receiver systems and triggers a microprocessor system which updates the time and date. This information is then passed to all of the control and data acquisition computers at the start of each second. The clock is synchronised to Universal Time (UTC) by continuously monitoring the "ticks" provided by a set of four GPS Station Clocks. These are derived from time signals received from the Global Positioning Network Satellites and are accurate to about 100 nsec (1/10th of a microsecond). By averaging these measurements in the PC seen in the lower half of the rack we can track the slow drift between JAT and UTC with an accuracy of order 10 nsec. Small corrections are then applied to the clock when required. 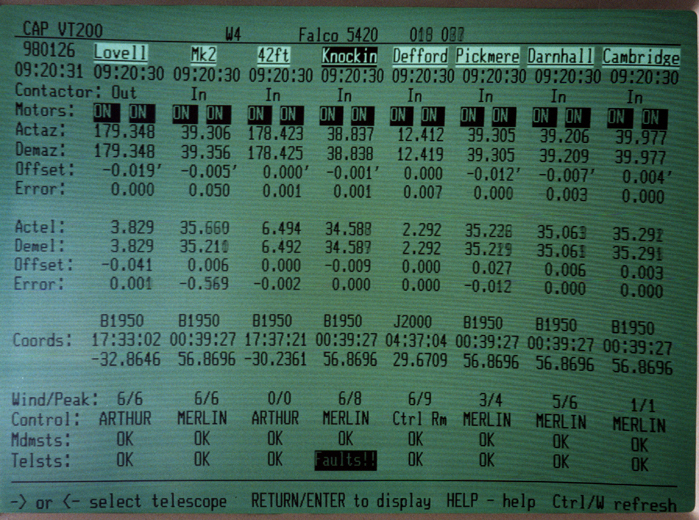 Monitor Display for the MERLIN telescopes and the 42ft telescope. 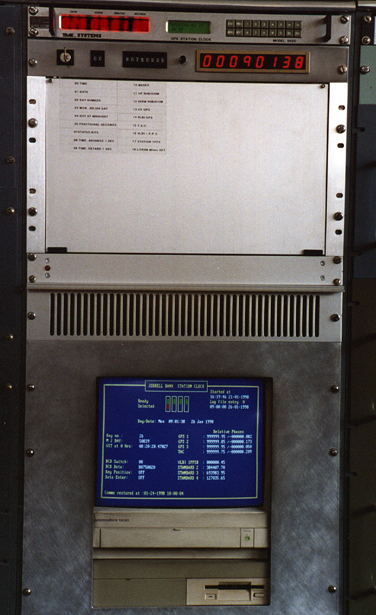 The duty controller also monitors the status of all the other telescopes including those part of the MERLIN array and the 13m and 7m telescopes on the Jodrell Bank site. Should the global display shown above indicate a fault associated with any telescope he can bring up a dedicated display for that telescope which will indicate the specific problem. The controller can bring back the images from several on site TV cameras to make checks as necessary. Once he has learnt what the problem has arisen he can alert the appropriate engineering team to arrange its rectification.